Powers/Abilities: Maguire Beck is a skilled computer programmer (specializing in holograms and virtual reality), illusionist, hypnotist, roboticist, and chemist. As Mad Jack, she wore an armored costume that was padded to make her appear masculine. She employed a power-sapping chemical she called "joy juice" and entrapped her victims in sensory-deprivation "happy tanks" full of hallucinogens. When more tangible illusions were needed, she employed a number of sophisticated robots. 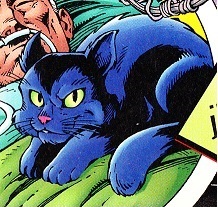 Prior to adopting the Mad Jack identity, she controlled a robotic black cat, which could attack enemies with its sharp claws and teeth, activate hypnotic suggestions with its purr, and could apparently nullify Spider-Man's spider-sense. History: (Spider-Man: The Mysterio Manifesto#3 (fb) ) - As a child, Maguire Beck idolized her older cousin, special effects master Quentin Beck. She was elated when Quentin went to Hollywood to make movies, and was even more proud of him when he became the villainous illusionist Mysterio. (Spider-Man: The Mysterio Manifesto#3 (fb)/All-New Official Handbook of the Marvel Universe: Mad Jack profile) - Eventually, Quentin trained Maguire, his former cellmate and replacement Mysterio Daniel Berkhart, and the enigmatic Conundrum in the ways of illusion. Maguire, who had become a computer expert, helped enhance Quentin's Mysterio technology. (Spectacular Spider-Man II#257 (fb) ) - At some point in the past, Maguire and Berkhart frequented Maguire's, an Irish pub in lower Manhattan. (Spider-Man: The Mysterio Manifesto#3 (fb)/All-New Official Handbook of the Marvel Universe: Mad Jack profile) - Maguire struck up a partnership with Berkhart; together, they designed the criminal identity of Jack O'Lantern, alias Mad Jack, using the original costume design of the late Jason Macendale. Berkhart wore the costume in the field, while Maguire assisted and communicated with him via a remotely-operated robotic black cat. They entered the service of Norman Osborn, assisting him in his plot to take over the Daily Bugle. (Spectacular Spider-Man II#243 - BTS) - Maguire assisted Berkhart when he attacked John Jameson as a way of getting to his father, Bugle publisher J. Jonah Jameson. (Spectacular Spider-Man II#245 - BTS) - Berkhart and the cat spooked Mary Jane Watson, appearing momentarily at her window. (Spectacular Spider-Man II#246 - BTS) - Berkhart and the cat attacked J. Jonah Jameson in the Daily Bugle's elevator. (Spectacular Spider-Man II#247 - BTS) - Berkhart and the cat lurked outside the window of Jameson's hospital room; when Spider-Man found them, the cat attacked him, allowing Jack to ambush him. The cat then snuck into the hospital, where it activated a hypnotic suggestion in John Jameson with its purr to kill the elder Jameson. Its mission complete, it departed with Jack. (Spectacular Spider-Man II#257 - BTS) - Berkhart and the cat stole the Hand of Mumthazi, a priceless artifact from the nation of Sufind, from the Metropolitan Museum, as part of another Osborn plot. They later met Conundrum, who had kidnapped the Sufindian ambassador's daughter, in the long-abandoned Maguire's pub, and offered to trade the Hand (which Conundrum coveted) for the girl. The cat detected the hero Prodigy (actually Spider-Man in disguise), and warned Jack and Conundrum with a hiss. (Spectacular Spider-Man II#258 - BTS) - As Prodigy gained the upper hand on Jack and Conundrum, the cat attacked him, pulling off his fake nose with its claws. Later, the cat was present for Jack's faked death at the hands of Osborn's security detail. (All-New Official Handbook of the Marvel Universe: Mad Jack profile) - After Quentin Beck's seeming death at his own hands after a failed attempt to drive Daredevil insane, Berkhart took over his Mysterio identity, and gave Maguire the now-vacant Mad Jack identity. (Spider-Man: The Mysterio Manifesto#1) - Maguire and Berkhart teamed up in their new identities to take down everyone who had ever sinned against Quentin Beck; Maguire had become mentally unstable, however, and came to believe that Berkhart was Quentin. Nevertheless, they entrapped J. Jonah Jameson in a fake "Hell", then attacked Quentin's old girlfriend Betsy Schneider (who had exploited her past relationship with Beck) and her husband Joe Smith with a swarm of killer action figures, capturing them as well. She then took on Spider-Man and Daredevil, drawing them together with a fake Spider-Man, then took them down with a flock of hallucinogen-spewing mechanical bats. She watched the chaos from her lair, having animated conversations with the silent Berkhart. (Spider-Man: The Mysterio Manifesto#2) - Maguire placed Spider-Man, Daredevil, and Smith in happy tanks, and watched gleefully as they experienced vivid hallucinations, while tormenting Jameson and Betsy with robotic copies of Berkhart and Quentin, respectively. They soon rebelled against the unreality of their fantasy worlds, however, and burst out of the tanks. Amused, Maguire pitted them against robotic versions of their greatest foes. (Spider-Man/Black Cat: The Evil That Men Do#6 (fb) ) - An associate of the Kingpin acquired Quentin's Mysterio costume and paraphernalia from Maguire; the Kingpin sold it to vengeance-seeking mutant Francis Klum. (Venom II#4 (fb) ) - A new Jack O'Lantern, an agent of the Crime-Master (Bennett Brant), claimed to have killed the previous Jack O'Lanterns, presumably including Maguire. Comments: Maguire the cat created by J. M. DeMatteis, Luke Ross, and John Stanisci. 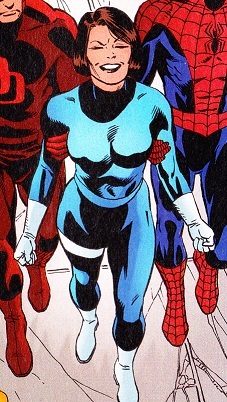 Maguire Beck created by Tom DeFalco, Lee Weeks, and Bob McLeod. Interestingly, the cat is not present when a seemingly-introspective Mad Jack visits the Jameson's apartment, then burns Norman Osborn's money. I'm not sure what (if anything) DeMatteis intended, but via retcon, it does imply that maybe Berkhart wasn't telling Maguire everything about their mission. Quentin Beck has since turned up alive, claiming that he'd faked his death all along. Either he didn't tell his cousin, or she was so crazy by that time that it didn't register. Oh, and what's with Maguire's bar? Did Maguire Beck own it? Did they just go there because it had the same name she did? On Earth-982, an older Maguire Beck returned to menace Spider-Girl (Mayday Parker) - that story also depicted a previous encounter Spider-Man and Arana had with Mad Jack, but presumably that happened in the past of Earth-982, not Earth-616. That story also mistakenly depicts Maguire as Beck's niece, not his cousin, even though as far as we know Quentin Beck was an only child. In the S.H.I.E.L.D. Operations Database backup in Secret War#1 (2004) Maguire Beck was mistakenly listed as an alias of Jason Macendale, a previous Jack O'Lantern. The backup was filled with mistakes (ie. Kravenoff instead of Kravinoff), so it was just another mistake. Who wrote it? Bendis was listed as writer for the main story, but I am not sure he wrote the backup as well. Within the Marvel Universe it could be considered bad info on SHIELD's behalf.